Fifa president Sepp Blatter has opened his re-election campaign by saying Australia deserves to host a World Cup, while rival candidates Luis Figo and Prince Ali Bin Al Hussein say they have the five necessary nominations to run. 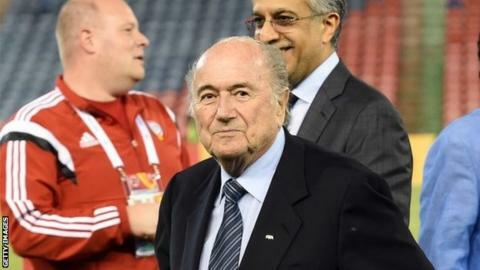 Blatter, Prince Ali, Figo and Michael van Praag have all gained backing from five or more football associations in the bid to be president until 2019. Swiss Blatter, Fifa's president since 1998, said: "It would be more than deserved if Australia were to stage the World Cup at some point." One of 39-year-old Jordan FA president Prince Ali's nominations was from England's Football Association. He released a statement saying: "Prince Ali's vision for reform addresses three primary goals: restoring Fifa's credibility; serving football, protecting the game and neutralising threats; and developing the game globally." Former Portugal and Real Madrid midfielder Luis Figo, 42, tweeted: "I am very happy to confirm my six nominations were delivered to Fifa this week ahead of the deadline. "I'd like to thank my colleagues and friends from the nominating FAs and across the football family who have already given me their backing." Dutch FA president Van Praag, 67, is a former chairman of Ajax and a member of Uefa's executive committee. Of the other known candidates, Frenchmen Jerome Champagne and David Ginola, the former is not thought to have received enough nominations yet, with the latter withdrawing from the race on Friday.